Microsoft, through its Customer Experience Improvement Program (CEIP), keeps an enormous amount of data about the way people use Windows. The folks who designed Windows 8.1 pondered mightily over the telemetry that they received from Windows 7 and relied on it heavily to make design decisions for Windows 8.1. The decisions they made for Windows 8 were inherited by Windows 8.1. Microsoft discovered that 67 percent of all searches performed on the Start menu in Windows 7 were to find and launch programs. Searches for files accounted for 22 percent, and Control Panel program searches came in at 9 percent. Those are astounding numbers. Between everyday apps and system apps (er, Control Panel programs), 76 percent of all the searches in the old Start menu simply sought programs — and almost all the rest were looking for files. That’s why the Start screen is heavily biased toward looking for programs. 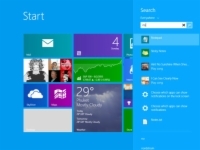 1Press the Windows key on the keyboard or the Windows button on your tablet to go to the Metro Start screen. If you have a keyboard, just type no. 2If you don’t have a keyboard, swipe from the right to bring up the Charms bar, tap the Search charm at the top, tap inside the Apps search box, and use the touch keyboard to type no. Windows immediately starts searching for programs, settings (Control Panel programs) and filenames that start with, or contain, the characters no. You get a very abbreviated list, typically with two entries for each type of file. Here, you can see that Windows returned two apps, two songs, two settings, and one file. 3Underneath Search in the upper-right corner, tap or click the word Everywhere and choose Settings. You see a very lengthy list of links to Control Panel programs and PC Settings locations, many of which contain words that start with the letters no. Why the other items appear on the list — Change system sounds? — remains a mystery. 4Underneath Search, tap or click Settings and pick Files. Then click or tap the magnifying glass to see a list of files that match your search. If you have any files at all on your computer, you undoubtedly see a swarm of files. Why? Because no matches all sorts of things: text inside files, song titles, pictures with the hidden tag Orientation: Normal or Flash mode: No flash, and on and on. 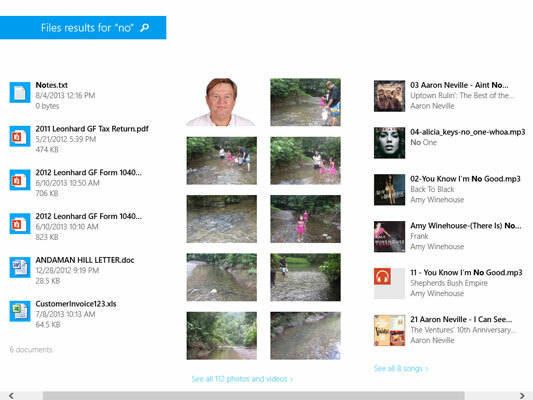 In Windows 8, Metro search would make all sorts of weird matches. For example, Word documents may match no because the documents are based on the template normal.dotx. Windows 8.1 has improved on that kind of stupidity — matching on completely extraneous metadata — but not, it would seem, for photos. 5Tap or click any search result to either see the setting or open the file, depending what you tapped or clicked. You can search in many tiled Windows 8.1 apps by just clicking inside the app, typically in the upper-right corner. For now, go back to the Start screen.